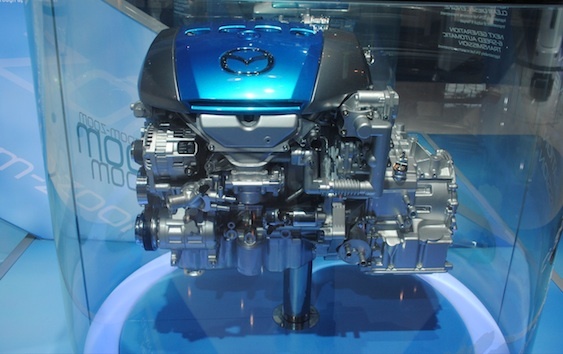 Early 2011, that’s when Mazda plans to surprise US citizens with a new high performance engine. The all new SKY-D Concept engine is a high performance engine that’s still new Americans. That’s mostly because this new engine is a diesel. Mazda haven’t gone completely diesel as Takashi Yamanouchi, representative director, president and CEO, Mazda Motor Corporation, stated at the New York Auto Show they will also be releasing the new SKY-G engine. The last letter in the engine name is critical, as while the first one comes from diesel, the latter is for gasoline. So what Mazda is promising all of the US buyers is high performance all around. The SKY-G engine is set to be the core behind all future powertrains of Mazda vehicles and the estimated fuel savings are around 15 percent while still providing an increase in engine power. Getting back to the SKY-D engine, the figures provided by Mazda for it are now completely amazing. If this engine were to equip the next generation Mazda 6 that car would get 43 mpg highway which is a 20% improvement on their current diesel and comparing to mid size hybrids of today is quite a bit better. Future optimizations of other components such as transmissions, weight reduction and aerodynamics is what Mazda think will be the future of customer satisfaction and the best way to achieve the global target of 30% fuel economy improvements by 2015.